Just three episodes remain in Breaking Bad’s 5th and final season, with a shootout in progress at the end of Sunday’s hour. 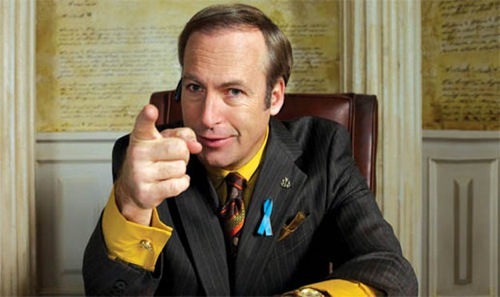 Bridging the gap, AMC has officially given a shout-out to creator Vince Gilligan’s publicly stated desire to do a BB spinoff series starring Bob Odenkirk’s super-crooked attorney character, Saul Goodman. This presumably could exhume some of Goodman’s prior associations with the now dead Gus Fring and Mike Ehrmantraut, respectively played by Giancarlo Esposito and Jonathan Banks. All three characters first appeared on Breaking Bad during Season 2. The series finale of Breaking Bad is scheduled for Sept. 29th, when it will go directly against Showtime’s Season 3 premiere of Homeland. AMC also has announced a second cancellation of The Killing after Season 3 failed to generate much buzz or ratings power. The Killing likewise was canceled after Season 2, but AMC later resurrected it. The five new Kennedy Center honorees, announced Thursday, are Billy Joel, Shirley MacLaine, Carlos Santana, Herbie Hancock and opera singer Martina Arroyo. This will be the 36th time around, and CBS says it has telecast a taped presentation of the awards ceremony every year since its inception. This year’s program will be shown on Sunday, Dec. 29th. Saturday Night Live’s new cast remains unannounced after the departures of Bill Hader, Jason Sudeikis and Fred Armisen. But the show’s 38th season has its first three hosts and musical guests. Former SNL stalwart Tina Fey will step in first, fronting the Sept. 28th season premiere with musical guest Arcade Fire. Then comes, urp, Miley Cyrus, who will both host and perform on Oct. 5th. The Oct. 12th host is Bruce Willis, with musical guest Katy Perry. SNL also will be losing “Weekend Update” anchor and head writer Seth Meyers when he takes over NBC’s Late Night with Jimmy Fallon early next year. Fallon will be supplanting Jay Leno, who for a second time is being dropped as Tonight Show host despite remaining No. 1 in all key ratings measurements.